The Chair of ISO TC 262 on Risk Management, Kevin Knight, has stepped down. His replacement was announced by outgoing Secretary Mick Maghar of BSI. 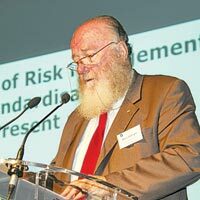 Knight is largely considered the architect of ISO’s recent interest in risk, having worked on Australian risk standards and then pushing aggressively to have them adopted by ISO as international standards. He is also thought to be “patient zero” for the imposition of risk in all ISO management system standards, having convinced the ISO Technical Management Board to include risk in its “Annex SL” mandatory rule set. The latest edition of ISO 9001 included “risk based thinking” as a means of meeting this mandate, over the objection of users and entire industries. The “Annex SL” dictate is controversial because it elevates risk management above other disciplines and practices, and is not easily meshed into every type of ISO management system standard. The injection of risk into ISO 9001 was a leading factor into the splitting of world’s automotive and aerospace industries from ISO standards; both industries are now pursuing “decoupling” plans that will see them publishing their own management system standards, and abandoning ISO entirely. Knight has remained unaware of the controversy surrounding his role in influencing the TMB and the resulting international fallout. Knight was heavily criticized for allowing the TC 262 to fall into disarray, to the point that individual members were threatening to sue each other for defamation during official proceedings last year. The group nearly split in two when a defection, led by Switzerland’s Bruno Bruehwiler, during the development of the next edition of TC 262’s flagship product, ISO 31000 on risk management. Knight remained absent during the battle, and refused all calls to bring the group to order, even as he continued speaking tours touting his credential as TC Chair. Knight was also controversial for his personal alliance with the uanccredited certificate mill G31000 and its founder, Alex Dali. Dali was discovered to have plagiarized his risk management publications, was caught posing as a woman online to attract members to his events, and is wanted under an arrest warrant in Singapore. According to TC 262 witnesses, Dali was ejected from TC 262 for “live-tweeting” meeting activities, against TC rules of decorum. Despite this, Knight refused to disavow Dali and G31000, continuing to speak at their events under his official capacity as ISO TC 262 Chair. 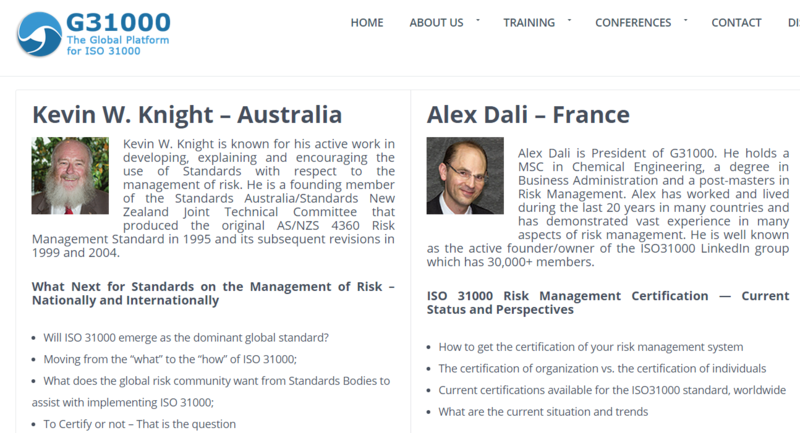 Knight told Oxebridge that he did not care about the problems, provided Dali was promoting his TC’s top standard, ISO 31000. Members within TC 176 largely consider Knight to have been an ineffective leader, more interested in promoting himself as the world’s top risk expert than actually doing the work required of a TC Chair. Knight was caught unaware that BSI was maneuvering to convert ISO 31000 to a standard eligible for certification, even as he was giving speeches indicating that ISO 31000 could never be used for such purposes. BSI later issued an ISO 31000 certificate to Tata Motors, without Knight’s knowledge. Knight once claimed he did not know that a speech he was giving was marketed by the G31000 group as promoting ISO 31000 certifications. Knight’s replacement is Jason Brown, who is also from Australia, and comes from the ISO Technical Management Board. Brown was single-handedly nominated by Maghar, who then resigned himself. ISO Directives do not allow for Chair positions to be filled via an election of the TC members, but instead by a single appointment by the sitting Secretary, which is then approved by the TMB. Maghar has been replaced by BSI’s Ben Carson. Brown has previous risk management experience in the security field, and likely has some of the same contacts as Knight. Oxebridge has sent a letter asking Brown about his plans for the TC, and whether he would distance the TC from organizations like G31000; to date he has not responded. Oxebridge had been pressing Kevin Knight to step down due to the problems that occurred on his watch.